Tella Tool added this 3000-W fiber-laser cutting machine to its production floor in March 2015. While it significantly outshines the company’s CO2-laser machine when processing thin-gauge sheet, Tella also finds it performs well on plate. Here the machine cuts 0.312-in. cold-rolled steel parts that then are press-brake formed into brackets, as seen in the accompanying photo of the formed brackets undergoing inspection in Tella Tool’s new coordinate-measuring machine (a Brown & Sharpe Global Performance Silver Edition). Much changed for Tella Tool & Manufacturing in 2012. That’s when the Lombard, IL, metalformer set a course for diversification. Early that year the 55-yr-.old-company replaced its aging laser-cutting machine with a new 2500-W CO2-laser cutting machine. Then in rapid-fire succession Tella added two new machining centers, and in 2015 a second laser-cutting machine. That 3-kW fiber capped its all-in move into a new level of laser cutting and production machining. “Since 2012 revenue has grown by 24 percent,” says Tella Tool president and COO Scott Prince. And almost all of that growth, he says, has come from the fabrication and machining sectors of the firm’s three-sector business (stamping being the third). “Diversification into fabrication and machining has allowed us to become less reliant on any one market,” says Prince. He notes that at one time the firm was 75 to 80 percent automotive. Now that ratio is near 55 percent, just where Prince prefers it to be. That initial CO2-laser machine hit the ground running in 2012, as Tella Tool within less than one year filled it with work from primarily new customers. Within two years the machine was churning out parts for two 10-hr. shifts per day, and on weekends. So says operations manager Richard Wagy. Prince also appreciates the ability, using the laser-cutting machines, to offer customers first-article parts in one day or even on the same day as requested. Much of the work cut on the two laser machines (both Trumpf models) route through the company’s six press brakes. Also dotting the floor of the 50,000-sq.-ft. plant are stamping presses, CNC turret punch presses, welding equipment, shears and drill presses. A neighboring building houses the firm’s array of machining equipment. And, the company operates a 50,000-sq.-ft. stamping plant in Brownsville, TX. 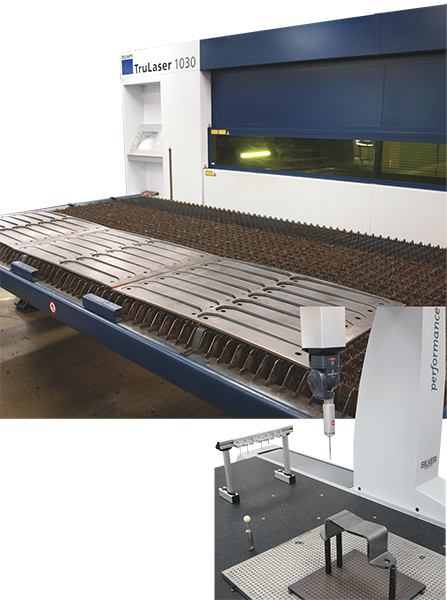 Touring the designated laser-cutting area of the shop, home to the Trumpf cutting-machine duo, we spied a somewhat surprising dynamic—the CO2-laser cutting machine was going to town on 0.060-in.-thick cold-rolled steel, while the fiber-laser machine sliced through thicker 0.312-in. steel plate. “We often run very thin material (as thin as 0.010-0.015 in.) on the CO2 machine,” shares Wagy, “because we find that the higher gas pressure associated with the fiber machine can blow the small parts out of the blank. We get better process control on these more delicate parts on the CO2 machine. Tella Tool’s display of fabricating work features an array of laser-cut, turret-press punched and press-brake formed parts for customers in the electronics, aerospace, telecommunications and other industries. 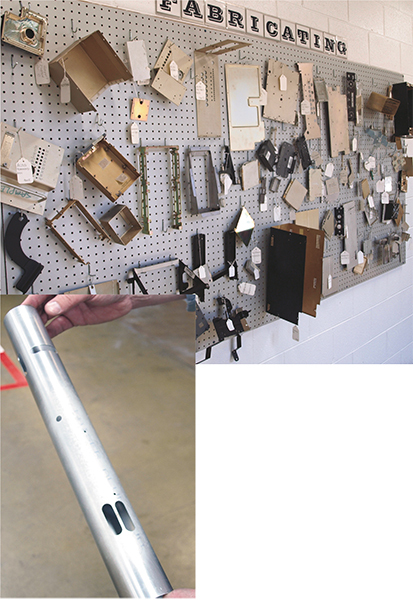 Cutting the tubular part (left)—which goes into an aircraft fueling system—on its fiber-laser machine required the firm to develop a special cradle fixture. To supply gas to its laser-cutting machine, Tella recently invested in bulk liquid-nitrogen and oxygen tanks. The tanks reside near the backdoor to the plant, enabling quick service from the firm’s gas distributor. Early in its laser-cutting adventure, Tella Tool found success earning work with very short runs (40 to 50 parts) nested onto small blanks sheared to size inhouse, or supplied by its service center. And, much of that work also required preprocessing on the firm’s turret presses, to punch holes or perform forming operations. Now, much of the growth in Tella Tool’s laser-cutting operations is from new customers with larger order volumes—1000- to 1500-piece runs that allow the company to run 4- by 10-ft. sheets. Along with this increase in order size has come the move to a kanban system for managing production through the fabrication department—turret presses, lasers and press brakes. “Evolving into the high-mix low-volume world,” shares Prince, “required a significant investment in hiring the right people and building their skill sets. And we’ve had to improve our scheduling and develop expertise in logistics. On the fab side of the building, we often have to schedule a series of processes that follow turret-press punching and laser cutting, including bending, hardware insertion, e-coating and assembly. Logistics on the stamping side are typically much simpler. And we have had to learn to communicate much more thoroughly and effectively with our suppliers and our customers. Of course, as part volumes rise in fabrication—to 2000 or more typically—the temptation to add hard tooling to the job, in part or in total, becomes greater. “For example,” explains Wagy, “we can tool the complete part run in a progressive die and run from coil, or we can laser-cut blanks and move those to a secondary die and add the required bends to the parts. Prince and Wagy agree that while integrating new laser technology into the company’s production processes occurred relatively quickly and painlessly, perfecting their use requires climbing an ongoing learning curve. In the shop, Wagy says that programming the cutting machines has not created any notable challenges—the firm uses FabriWin CAD-CAM software, from Metalsoft, to enter approximately four new part numbers into the laser-cutting machines per week. However, supervisor Yanel Lopez explains that learning how to fine-tune process parameters on the shop floor is where significant efficiency gains can be found. When we visited, Lopez had recently attended fiber-laser training at Trumpf, in Farmington, CT, and had picked up some CO2 operating tips at the same time. Asked to cite a recent example, Lopez points to the job running on the CO2 laser during my visit—the 0.060-in. cold-rolled steel sheet. On the fiber front, one operating tip quickly became evident.